The Assure 24kW is a highly reliable, wall-mounted, condensing, System gas boiler that can fit within a standard cupboard, designed and manufactured by Potterton. Not only is this a space saving boiler that you can keep out of sight, the pipes are behind the facility within the boiler casing, to save time, space and money on the installation. A high seasonal efficiency of 93% makes this an ErP A rated boiler that will help to reduce your energy bills. An output of 24kW gives the unit enough power to meet the heating and hot water demands of homes with 2 bathrooms. 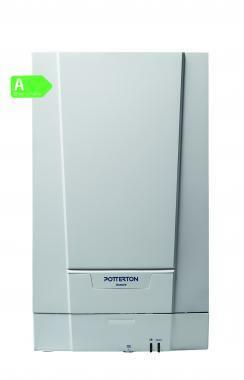 This boiler is a System unit, but it’s also available as a Combi or Regular boiler too. There’s also a range of outputs, including 12kW, 15kW and 18kW, all in addition to the 24kW unit. The 12kW and 15kW ratings are ideal for smaller homes with 1 bathroom and not such a high demand for heating and hot water, while the 18kW system is best suited to medium-sized homes. The Potterton Assure is a lightweight boiler, has front access to all components, comes fully modulating and has been intelligently designed to use the right amount of fuel and help to save you money. It has a central flue and flueing options of up to 20m for flexible installation, an optional outdoor weather sensor and a built-in drip tray to protect the unit against water ingress in extreme weather conditions. As this is a System boiler, it sends hot water to the radiators and a sealed hot water storage cylinder. All the important parts built into the boiler itself, making it more compact and easier to service that a Regular boiler. Available with a 2 year warranty, you can have the confidence that you’ll be well covered by Potterton after the installation.